The U.S. Naval Institute Chronicles series focuses on the relevance of history by exploring topics like significant battles, personalities, and service components. Tapping into the U.S. Naval Institute's robust archives, these carefully selected volumes help readers understand nuanced subjects by providing unique perspectives and some of the best contributions that have helped shape naval thinking… over the many decades since the Institutes founding in 1873.This edition of Chronicles culls articles and excerpts from the vast library of the U.S. 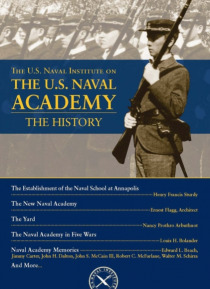 Naval Institute Proceedings to tell the story of the U.S. Naval Academy, training ground for the men and women who serve in the U.S. Navy.